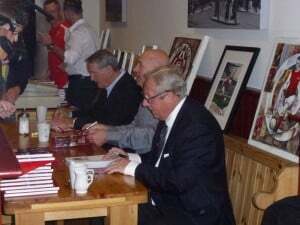 Dave Seager’s new book, Geordie Armstrong On The Wing, was launched today with a well-attended signing ahead of the Gunners’ home game with Hull City at The Emirates. Double-winning icons – Frank McLintock, Eddie Kelly and John Radford – signed copies of the book, whilst the author and the Armstrong family mixed with fans who had come to the stadium early to respect one of the club’s favourite sons. Further signing events will take place in the coming weeks – with Liam Brady and Bob Wilson agreeing to support the publication and a very special team mate.